The Best UK Satire Blogs from thousands of UK Satire blogs on the web using search and social metrics. Subscribe to these websites because they are actively working to educate, inspire, and empower their readers with frequent updates and high-quality information. UK Satire newsletter is a comprehensive summary of the day's most important blog posts and news articles from the best UK Satire websites on the web, and delivered to your email inbox each morning. To subscribe, simply provide us with your email address. UK About Blog The Daily Mash is a satirical website which publishes spoof articles, i.e. it is all made-up and is not intended, in any way whatsoever, to be taken as factual. Facebook fans 820,787. Twitter followers 140,924. London About Blog NewsThump is one of the UK's fastest growing humour websites providing a daily satirical take on current affairs from around the globe, only without the facts. Facebook fans 357,041. Twitter followers 49,052. UK About Blog NewsBiscuit was launched by John O’Farrell with the noble aims of eradicating global poverty, creating a lasting peace in the Middle East and providing a daily dose of humour to bored people at work. Facebook fans 9,894. Twitter followers 12,888. About Blog British political satire news breaking headlines direct from the UK. Established satirical newspaper. Bringing you leading stories 24 hours a day. Facebook fans 34,750. Twitter followers 42,980. United Kingdom About Blog The Poke is a satirical and topical news source, aiming to deliver an antidote to the daily grind. With the discovery of new British comedy talent firmly at its core, we publish photoshop-led topical articles that cover UK politics, world news, tv arts and culture, science and technology, celebrity and sport. Facebook fans 845,461. Twitter followers 232,455. About Blog This is a very obviously a rarely funny and often offensive fabricated satirical news source. About Blog The Liberator is here to free you from the burden of critical thinking. UK Satire and other junk. Facebook fans 495. Twitter followers 36. United Kingdom About Blog Swansea satire site, trying to offer up some funny stories to help people make it through the day. All of what you read isn't true unless otherwise stated. Facebook fans 4,309. Twitter followers 715. About Blog The Post Truth Post is a British spoof news and satirical website providing a comical spin on the news of the day. While we pride our high journalistic standards please remember we are making it up and nothing we post is true. Facebook fans 355. Twitter followers 8. About Blog Satire and spoof news, plus humorous and dark short stories from UK writer Tim Neill. Facebook fans 67. Twitter followers 84. England, UK About Blog A stinging satire on the everyday life of British author Jules Smith. Follow this blog for the latest updates and articles. Facebook fans 215. Twitter followers 321. UK About Blog The Sleaze is a UK based satire and humour site. The Sleaze offers an uncompromising, off beat and savage view of our world with British Political Satire, News Satire, Pop Culture Satire, Religious Satire, Royal Satire, Crime Satire, Weird Satire News Parody and Surreal Humour. Facebook fans 34. Twitter followers 94. About Blog Contemporary stories with a satirical edge!!! Facebook fans 928. Twitter followers 34. Devon UK About Blog Hillie Richens' blog diary about surviving small villageness. Country twee is definitely not me! Facebook fans n/a. Twitter followers 1,016. 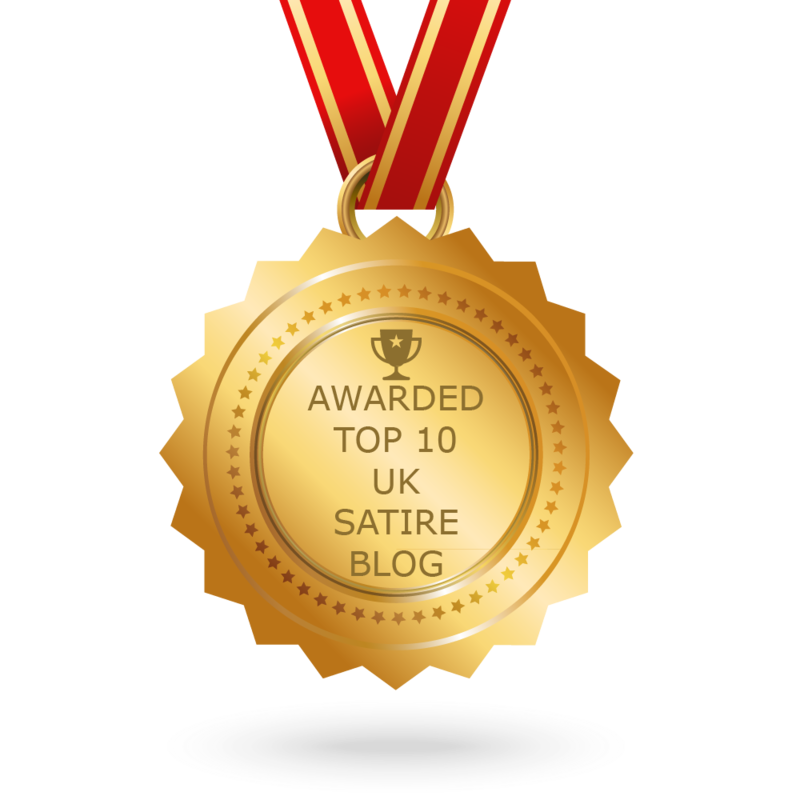 CONGRATULATIONS to every blogger that has made this Top UK Satire Blogs list! This is the most comprehensive list of best UK Satire blogs on the internet and I’m honoured to have you as part of this! I personally give you a high-five and want to thank you for your contribution to this world.